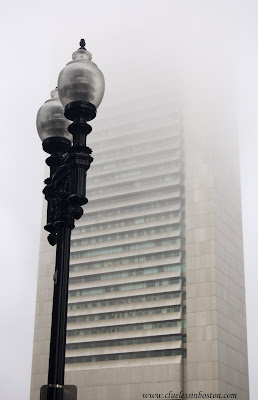 This is the fog enshrouded 32 story Federal Reserve Bank at South Station. To view a picture of the Fed on a bright sunny day, visit Fénix at Bostonscapes Daily Photo by clicking here. This photo is spectacular! Your capture of that lantern against the dense fog is perfect. I hope people will click the photo to see it enlarged. What a visual treat!